Films Division joins Green Maharashtra drive. 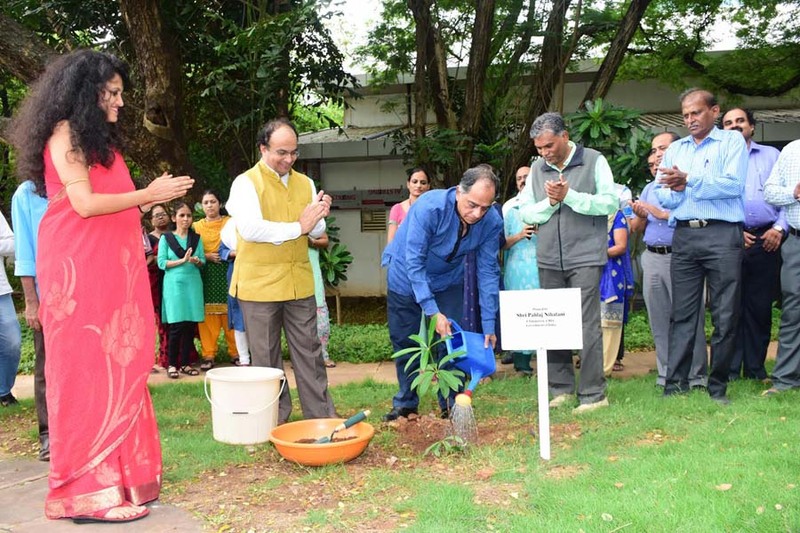 The Films Division under the Ministry of Information & Broadcasting also joined the ‘Green Maharashtra’ drive today by planting a number of saplings in its sprawling complex on Pedder Road in Mumbai. A total of 40 saplings were planted, with the hope of increasing the green cover at the complex, where the prestigious National Museum of Indian Cinema is also coming up. Chairman, Central Board of Film Certification, Pahlaj Nihalani and other senior officials of the I&B Ministry media units including DG, Films Division Manish Desai, Director Swati Pandey, Addl. DG, Doordarshan, Sudarshan Pantode, CEO, CBFC, Anurag Srivastava and CEO, Children’s Films Society, Shravan Kumar also planted saplings. Maharashtra forest department has launched an ambitious campaign of planting 5.5 crore saplings during this month. Out of this, 2.0 crore saplings are being planted in non-forest areas. Over 4,000 saplings will be planted in Mumbai city alone. To make tree plantation a mass movement, the state government has been making extensive use of mass media and digital media to propagate the ‘green Maharashtra’ message. Films Division has prepared a two-and-a-half minute AV, ‘Harit Maharashtra’ incorporating appeals of Maharashtra Governor C Vidyasagar Rao, CM Devendra Fadnavis, Forest Minister Mungantiwar and Brand Ambassador Amitabh Bachchan, which is currently being screened in cinema theatres across Maharashtra. Maharashtra Minister for Finance, Planning and Forests, Sudhir Mungantiwar in his message has said “today, Maharashtra has a forest cover of only 20%. We need to increase it to 33%. Every single tree planted will increase the tree cover and help reduce the carbon foot print . In this regard, Films Division initiative is welcome”.